Countertops are like an empty canvas in stores and ready to be put to work with a style like no other. Create a one-of-a-kind piece of art out of your service area by utilizing that exhibiting space with sign holders, jewelry racks, or filled freshly baked pastry fixtures. 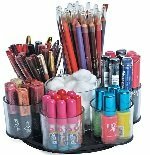 Make your counter-top displays work for you by gaining the attention of your patrons when they are closing out their purchases at the cash register for products or services rendered. Customers making impulse purchases can be a large part of your profits. With that in mind, choose from a large variety of options that best fits your individual service area needs. The more appealing the merchandise showcased on countertop displays the higher the chances of last-minute buys. Customers never stop browsing while shopping even at the checkout lines. Show off other products like jewelry, candy, gift items, baked goods plus much more and take a chance on gaining another sale for the day. With so many options, be creative in your set-ups, get your customers to say "wow, that's cool I want one." Retailers will be happy for seeing returning customers and potentially bringing in new clients. 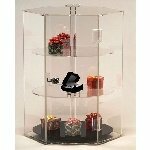 Counter space fixtures are also a great way to contain items throughout your store, such as jewelry stands on top of glass cases and other display stands that will attract those shoppers. 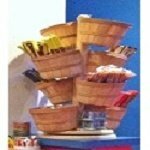 Take advantage of that open space to exhibit more of your goods for clearly visible shopping. Take care of your customers and they take care of you. Come and check out the many varieties of our counter-top holders and exhibits today!